Help us eliminate improper payments by learning and following the rules. 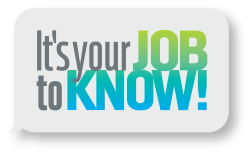 It’s Your Job to Know! Am I Still Eligible For Unemployment Benefits? You may file for your first payment online beginning the Sunday immediately following the date you filed your claim. The deadline to claim for weekly benefits is Friday at 4:00 p.m. Central Standard Time. Filing on time every time will help you prevent a delay or denial of payment. File weekly certifications online through HiRE at www.LouisianaWorks.net/hire, or if you are not able to do so, call 866-783-5567 to stay on track. UNEMPLOYMENT FRAUD IS PREVENTABLE! Help us eliminate improper payments by learning and following the rules. It’s Your Job to Know! Do You Know Someone Working And Getting Unemployment? I can get away with claiming benefits while working; the Louisiana Workforce Commission has no way of checking. False. We use many sources to monitor when you start working again. Once I get a job, I should wait until after I’ve received my first paycheck to stop filing. False. If you file, you must report your gross earnings for each week even if you have not been paid yet. I don’t need to report my part-time job since it’s not a full-time or permanent job. False. Any money you earn, even from a part-time job, must be reported (yes, that includes tips!). I don’t have to report my severance, holiday, vacation or bonus pay I received from my employer upon being let go. False. You must tell us if you receive or expect to receive any additional money from your employer. I don’t have to look for work each week, only when I see something I really like or feel like applying for. False. You must look for work each week, contacting a minimum of three different employers. I’m entitled to my maximum benefit owed to me even if I return to work. False. Once you return to work your benefits may be reduced or stopped completely. If there is a balance when your benefit year expires, it is lost. When Must I File and How Often? You must continue to file each week for as long as you do not have a job and are eligible to claim unemployment benefits. You will be claiming benefits for the prior week. If you forget to file on Sunday or Monday, you may file on any other day of that week. The deadline to claim for weekly benefits is Friday at 4:00 p.m., Central Standard Time. If I Earn Some Money Working, I Don’t Have to Report It, Do I? If you begin work, you must report ANY earnings for the week you work, even if you have not yet been paid. Include ALL income, commissions and tips. Report the gross amount before deductions. When Do I Stop Filing? NOTE: Each week when you request payment, you will be asked, “Did you work between (date) and (date).” If you worked on or between those two dates, you must report earnings. If I Get a Part-time Job, Am I Still Eligible for Unemployment Benefits? Maybe. Part-time workers filing weekly must report wages earned before taxes; you may still be eligible for reduced unemployment benefits. Not reporting part-time earnings while claiming unemployment benefits is fraud and will result in an overpayment. You will have to pay the money back before you can ever receive benefits again. What Else Must I Do to be Eligible for Unemployment Benefits? You MUST be able to go to work each day. If you were offered a job today, you must be able to accept. You must look for work by contacting at least THREE different employers about job openings during EACH week that you claim unemployment benefits. You MUST contact DIFFERENT employers each week. You should keep a list of your work searches. You must apply for suitable work that you are able to perform. The law says you will be disqualified for benefits if you do not have a good reason why you do not apply for available work or accept suitable work when offered. Are There Any Other Wages/Earnings I Must Tell the Louisiana Workforce Commission About? You MUST tell us if you receive or expect to receive ANY money from your employer. This includes vacation or holiday pay, bonuses, severance pay, separation or dismissal pay, wages received instead of notice (in lieu of notice), tips, commissions, military retirement pay, workers’ compensation, WARN Act and any other payment based on your previous work. If you do not tell us about these payments, you could be disqualified for unemployment benefits, and you will have to pay back any benefits you have received. What Happens If I Don’t Report Earnings? Any unemployment payment you receive that you are not supposed to get is considered an improper payment. The Louisiana Workforce Commission will recover overpayment balances by deducting the amount from your future unemployment payments, or if necessary by taking any federal and/or state income tax refunds you expect to receive. You will be ineligible to receive benefits until you repay the amount you owe. You will no longer be able to receive unemployment benefits for as long as 52 weeks. Liens may be assessed against property you own until your debt is paid. If the overpaid amount is not repaid after 30 days, you will also be charged a penalty of $20 or 25% of the balance, whichever is greater. Your federal and/or state income tax refunds may be taken to pay the debt you owe. Your recreational hunting and fishing licenses may be suspended. You may be referred for legal action. We use many sources that report when you begin work. Failure to accurately report your earnings yourself may result in an improper payment. Any overpayment of unemployment benefits must be repaid by you. Equal Opportunity Employer/Program | Auxiliary aids and services are available upon request to individuals with disabilities. This page was last updated July 2017.